frightening moment and we had a dry and sunny trip. ahead of us in Rye Lane) and along the Surrey Canal. long as the axes aren't labelled). Route file below or via this link. Can be uploaded into Bikehike. We did the same ride as the week before and I must say it was better the second time around: David was a great leader and gave the group an insight to the history of locations on route. 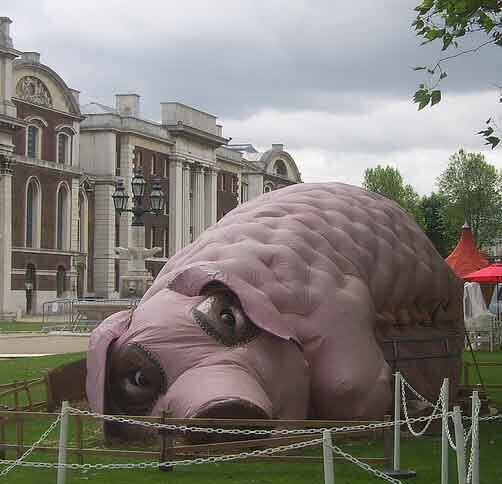 We did see the same pink elephant on route and a pig at the Naval College! A good time was had by all and none of the seven riders were lost on route maintaining the Healthy Ride's 100% survival record! 9 riders plus Max from Cycle Instructors. Having done N and S, today we did East. Up past Nunhead Cemetary to Telegraph Hill. Visibility across London very good – could easily see the Wenbley Arch glinting in the sunshine. 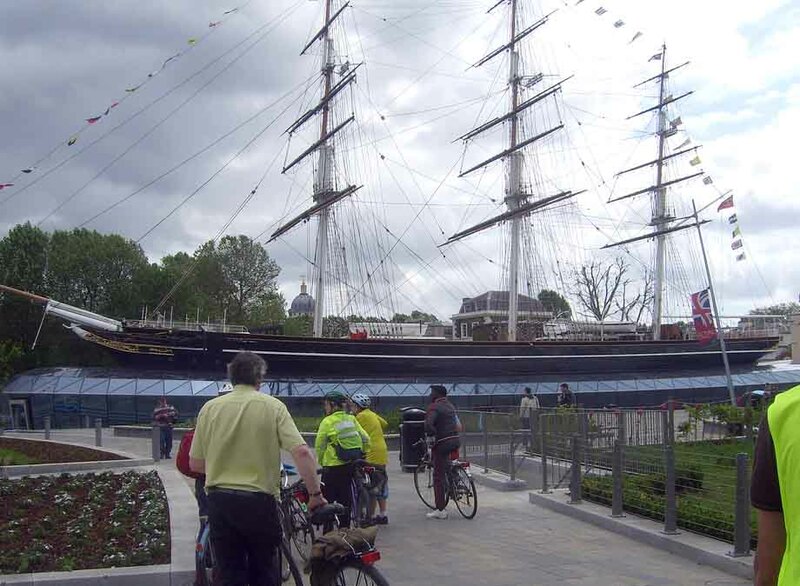 Then down to Greenwich waterfront via Deptford Bridge. Back by flatter route using off-road path through Deptford and Surrey Canal Road cycle path. 8.5 miles in very windy conditions – so we all knew we had been riding! Route at https://maps.google.co.uk/maps/ms?msid=209612897753917009459.0004c289fd15c869c8efd&msa=0. 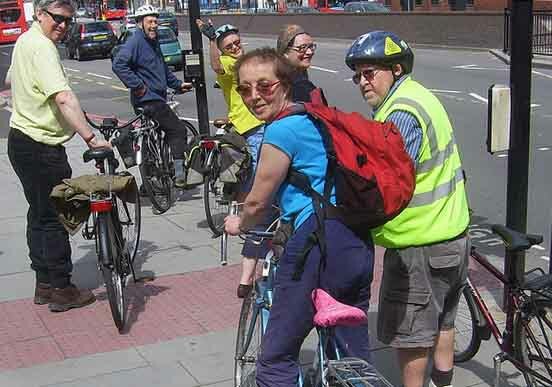 Next ride, again Peckham Square, Sat 23rd, 10am. This marks the end of Bike Week, so again free key fobs for everyone riding! 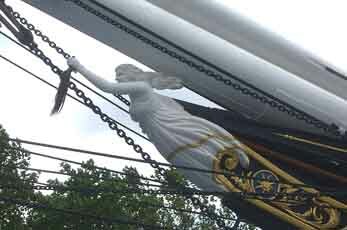 Cutty Sark figurehead. Photos by Michael Hayes. 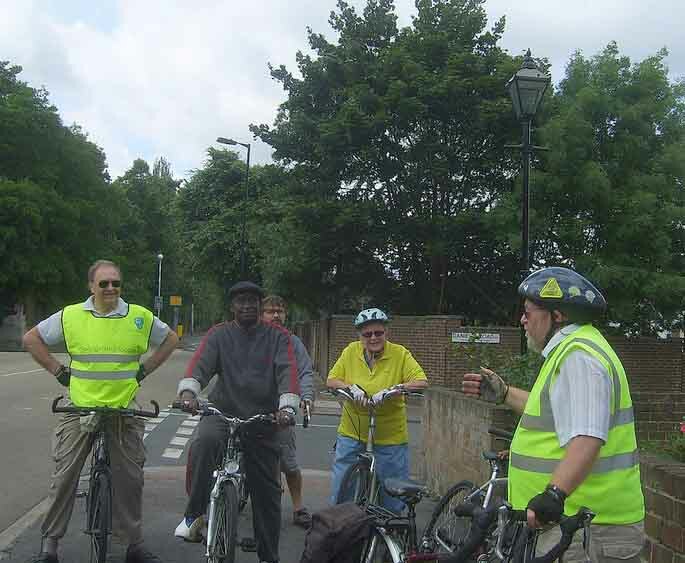 10 riders (including 2 new riders) plus Charlie from Cycle Instructors. Headed South to Dulwich Park via Peckham Rye. Brief diversion to cycle shop in East Dulwich to get a new inner tube! On to Herne Hill Velodrome. 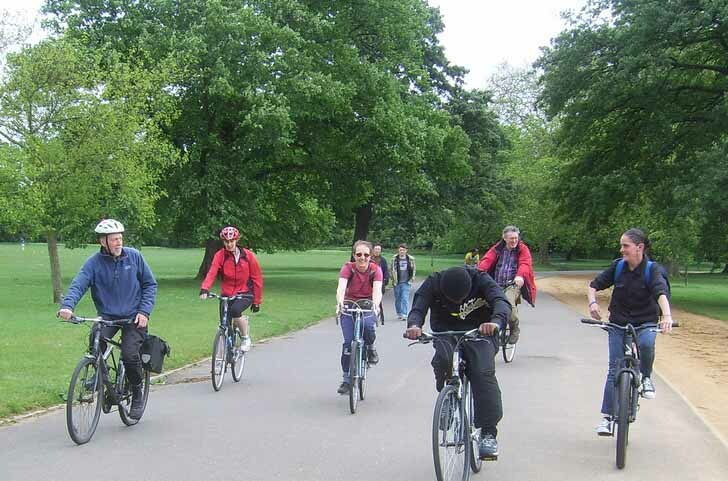 Much activity – children on the mountain bike trail and adults learning to ride the track. Back via Greenvale and Warwick Gardens. Only 6.5 miles, route at http://goo.gl/maps/zt4z. 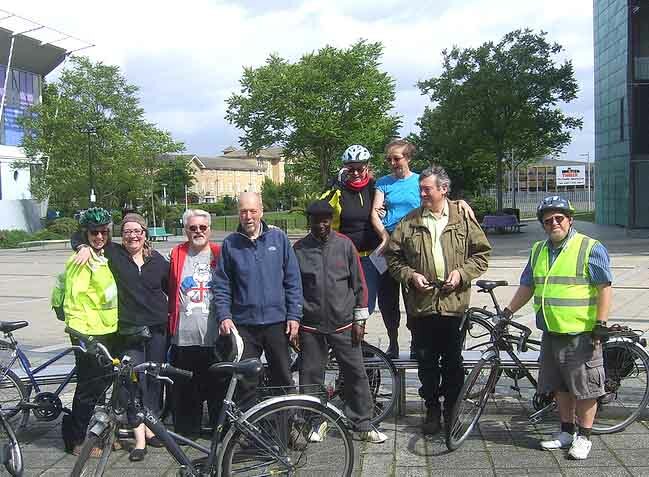 Next ride, again Peckham Square, Sat 16th, 10am. This marks start of Bike Week, so free key fobs for everyone riding! Start/Finish Peckham Square. Despite damp weather and bank holiday, 6 riders (including 3 new riders) plus Charlie from Cycle Instructors were there at the new start. 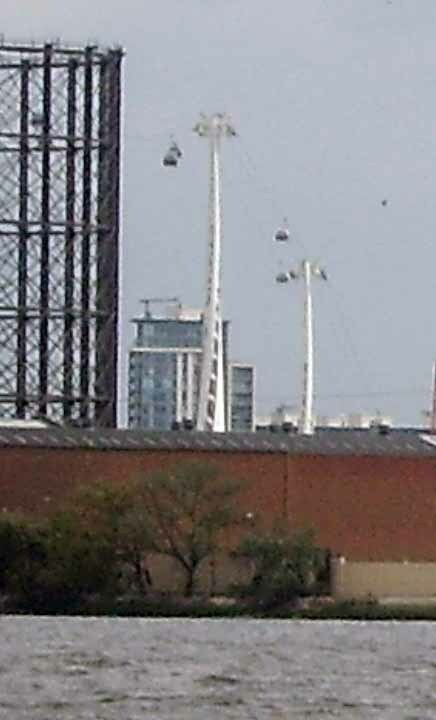 Headed for the river along the LCN22, canal path then quiet-ish roads to Bermondsey St and eventually City Hall. Looked at the boats getting ready for the Thames Pageant. Return also initially by LCN22, Weston St tunnel, then own route to Bricklayers Arms and through the Salisbury Row area. This is a recently finished Southwark project to calm some streets and green them. Looks OK (click here for Living Streets review). 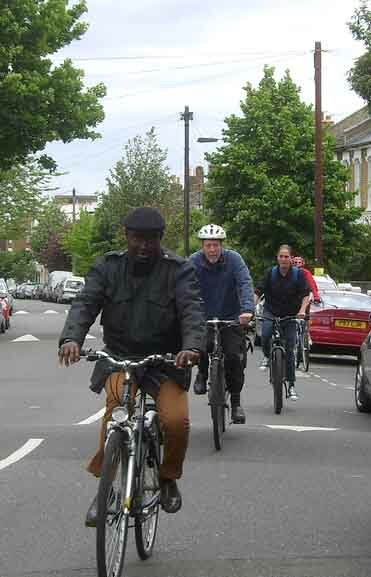 Back to Peckham via Thurlow St, Wells Way, south edge of Burgess Park and the canal path.